PLEASE NOTE: LINK FOR THE FREE HYPNOSIS DOWNLOAD CAN BE FOUND ON THE COPYRIGHT PAGE, OPPOSITE THE CONTENTS PAGE The Ultimate Programme to End Dieting...Forever Marisa Peer introduces her revolutionary method of reprogramming the brain to alter feelings and associations related to food, to enable everybody to have a healthy relationship with it and, as a result, have a healthy body at a sustained ideal weight. 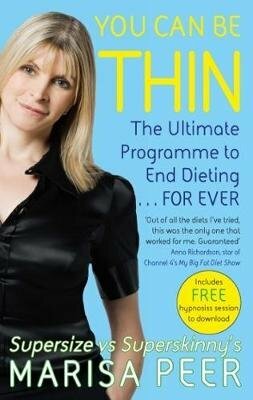 With its refreshing and empowering style, YOU CAN BE THIN works on many levels by using techniques including fun and powerfully affecting exercises, subtle repetition and straightforward questionnaires to break negative patterns and banish cravings. An effortless process, the reader's progress through the book is a hypnotherapy treatment in itself. Addressing habitual eaters, emotional eaters, addicted and ignorant eaters, the cure, which is not to be found anywhere else, lies in the process of reading the book.